A closer look at the stub switch mechanism itself. 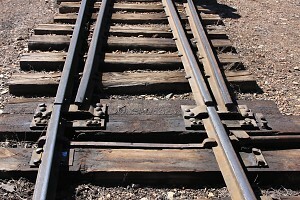 A stub switch is a railroad track switch that lacks the tapered point rails of a conventional switch. Instead, both the movable rails and the ends of the rails of the diverging routes have their ends cut off square. 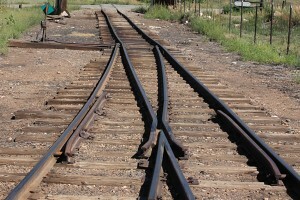 The switch mechanism aligns the movable rails with the rails of one of the diverging routes. While common in early trackwork due to their simple, cheap construction, nearly all stub switches were replaced with standard point switches. Due to intrinsic alignment issues, stub switches are unsuitable for fast and/or heavy trains. On standard gauge railroads, nearly all were eliminated by 1900. A good number survived on the narrow gauge, and as a rare exception, at least one (the wye tail switch at Wasson, CO) survived on the standard gauge Creede Branch.